JUMPSTART! Young Performers Theatre is presenting two exciting plays at the Mendocino Art Center’s Helen Schoeni Theatre this weekend. In “Summer Friends”, a mother’s young children discover that other teenagers have broken into and taken up residence in their summer cottage. The cast includes Dean Assaf, Kyle Brandon, Wolfgang Cressman, Raina Deerwater, Quinn Fields, Sofia Impellizzeri, Laurel Livezey, Dannie Moore, Elijah Ravitz-Campbell and Elissa Warner. Thursday through Saturday, July 24 – 26 at 8 p.m. (Note: this show contains a PG-13 Advisory). Ever since I moved here, the Mendocino Music Festival has been one of the highlights for me. For 2 weeks in July, the town of Mendocino is oriented around the Music Festival. 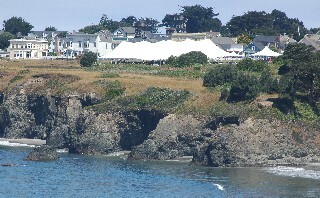 The Festival concerts are held in a huge tent on the Mendocino Headlands, and the music is varied: classical, jazz, Big Band, and more. This year is a personal treat, since I am singing in 2 different events. For the final orchestral concert on July 26, I am part of the chorus for Beethoven’s Ninth. On Saturday, July 19, the AcaFellas are performing in the Village Chamber Series. The concert is at 3 pm in Preston Hall, adjacent to the Mendocino Presbyterian Church on Main Street. The AcaFellas are nine strong, all male voices, and we’ve been singing together for about 5 years. We’ve also added a quartet of ladies (the AcaBellas) for some numbers, and we have a great variety of songs in store for you. Check it out! Read more about the Mendocino Music Festival. People set up for the parade at the Kelley House. 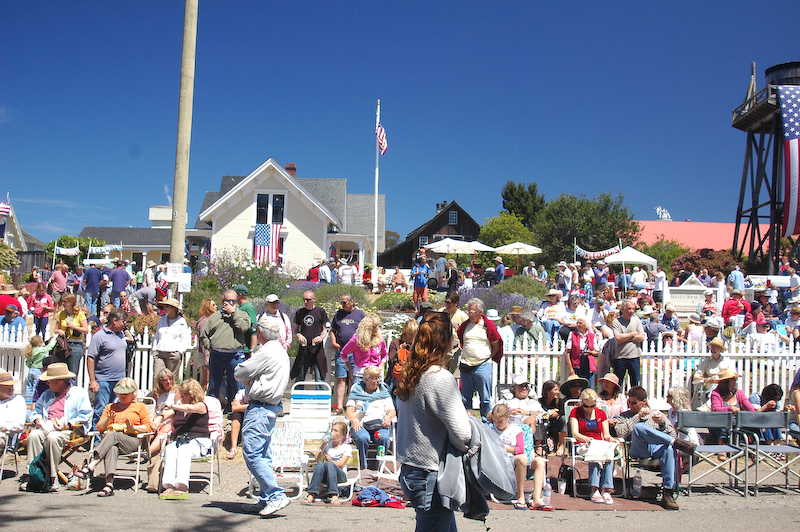 Friday is Independence Day, and the place to be is in the village of Mendocino for the annual parade. I’ve been going to these for quite a few years now, and they never fail to entertain in one way or another. The parade winds its way along Main Street and up Landing Street, and it starts at Noon. A great spot for watching the parade is down by the Kelley House. They will be serving food and drinks from 11 am to 3 pm, featuring sausages, hot dogs, chips, ice cream, sodas, wine and beer. They are the only place in town serving alcohol after the parade this year, since the big after-party at Friendship Park is alcohol-free. The popular local band Kevin and the Coconuts will be playing all afternoon at Kelley House, and there is also live music at Friendship Park. The parade is sponsored by the great folks at the Mendocino Coast Chamber of Commerce. On Saturday, the World’s Largest Salmon BBQ runs in Noyo Harbor from 11 am to 6 pm, followed by the big fireworks display. The MacCallum House also sponsors the Albion Street Block Party on Saturday afternoon. For more details about these and other coastal events, visit our Fourth of July Weekend page. Travelers will discover a welcome new vacation spot the next time they drive up the scenic Mendocino coast: Cottages at Little River Cove. Comprising nine stand-alone cottages, the cozy, two-acre property is situated high on a bluff overlooking the Pacific Ocean and is perfect for travelers who desire private accommodations, modern full kitchens and baths, comfortable bedrooms and amazing ocean views. The property’s location is an ideal jumping off point to the Village of Mendocino – just two miles away – and offers easy access to the area’s dramatic ocean vistas, natural flora and fauna and outdoor activities ranging from kayaking and biking to quiet walks on the beach.